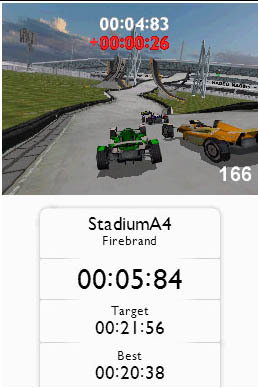 The final version of TrackMania DS has arrived and even though Impulse Gamer was lucky enough to have a look at the pre-release version, the final version is amazingly even more impressive that left us flabbergasted. This could be considered the ultimate car racing title on the DS! With that said, this is the best racing game ever on the Nintendo DS which not only features solid gameplay but some of the smoothest graphics to have ever raced on this popular console. Developer Firebrand should be applauded for this exclusive DS conversion that if I could be so bold is as good as the PC version but best of all, it’s for the portable world of consoles. The game contains three different game modes to get you incited, however where the title does shine is through the amazing ramps, loops and jumps as you race at insanely fast speeds. There’s even some great puzzle levels to assist with the gameplay. The developers have truly added a unique and realistic sense of speed to the game that is actually quite rare on the DS. Whether you're racing at insane speeds or making loops, the realism is quite impressive and at times does give a sense of vertigo. The control system of the game has received a revamp in order to maximise the playability of the title as gamers use A to accelerate, B to brake and the D-Pad to control your car. Even though the control system is quite basic, it works like a charm as you attempt to navigate your vehicle in this 3D gaming universe. This simplistic control system is great for novice gamers, however more advanced gamers will be appreciate the amount of control these simple controls do actually give. 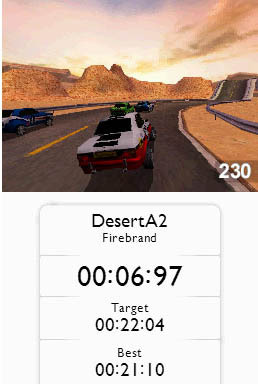 The game also contains a track editor which allows you to save up 60 different tracks that you have designed which is great for sharing your tracks with other Nintendo DS gamers. The editor is quite easy to use, thanks to the stylus as you drop, drag and create some awe-inspiring tracks. Graphically, for a Nintendo DS game, the game is quite visually impressive and features some great background environments and a detailed draw distance that assists in drawing you into this racing world. Check out the above screenshot to see the impressive draw distance. The texture details on the cars are quite detailed and colourful, match that with great polygon models and a few special effects here and there and TrackMania DS is almost perfect in this category. There are also a variety of different gaming worlds from outdoor settings such as deserts to lush green lands and even some stadium courses. In conclusion, after seeing the preview version of this game, the final version is far superior and that was a great game. Definitely one for those interested in a decent racing game with a solid track editor. Perfect controls, great graphics and a game that can be played by everyone.